Goodwill was good to me! This is my entire "junking" haul...if you can call it junk. 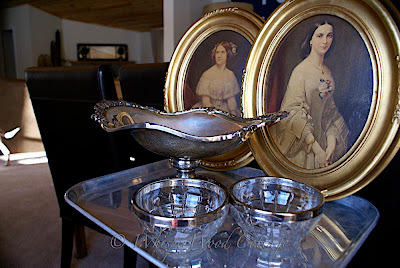 The painting on the left is of Jenny Lind (1820-1887), Swedish opera singer known as the "Swedish Nightingale." The artist was Eduard Magnus (German, 1799-1872). The painting on the right is called "Southern Belle." It was painted by Erich Correns (German, 1821-1877). They are labeled as "Genuine Oil = Art Portraits" from B.A.P. Co., Chicago. Here is one of them in the guest room. The matching one is on the other side of the bed. Do you like the Goodwill finds? I do! Love it when a trip to GW Home ( aka Goodwill ) pans out. Its always hit or miss here but its only 2 miles away so I usually go dailey. Great finds! I love GW!! Did you get my email about the size of the tulips!!?? Oh my! What nice goodies you found at Goodwill! 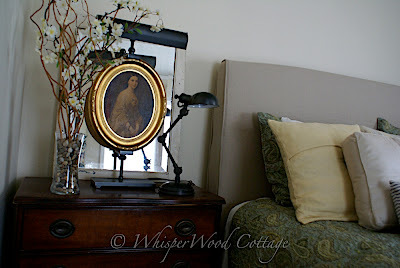 I adored the way you displayed the painting on the bedside table! Oooohhh, your GW is better than our GW. I do enjoy our Hospice Thrift store, though. Lucky you! Our Goodwill never has such great finds. What a lucky ducky you are!!! Way to zero in on some great finds! GW? Better look into those paintings! Antiques Roadshow had on a few weeks ago a GW painting (bought for $5, valued at $85K!) LOL! Wouldn't that just boost the junking budget!!! oh my gosh! That is amazing!!!!! Goodwill was definately good to you! Holy cow! I can't believe you found those at Goodwill! I'm obviously shopping at the wrong places! Lookin' good little momma. The guest room just looks like it is missing the perfect guest - me! Miss you guys! Some of those finds are not really 'junk' are they. They look wonderful. Well, I do love Goodwill, and other thrift stores, but I don't usually have the same good luck you do!